Forum Index > Off-topic Talk > Collections Near Perrugia? Posted: Mon 03 Jan, 2011 7:55 pm Post subject: Collections Near Perrugia? Does anyone know of any arms and armour collections--small or large--near Perrugia, Italy (within maybe 100km)? Posted: Tue 04 Jan, 2011 2:37 pm Post subject: Re: Collections Near Perrugia? Only, I know bronzes relevant to a complete armour, consisting of helmet, schinieri (is a piece of armour that protects the leg - Greaves perhaps the correct term in your language ) breastplate and shield. Museo Archeologico Statale di Terni. Sword italic, type Cuma: a semicircular base of the blade. Plate to the frame of the very large pommel. Narrow base of the blade with sloping shoulders (type C). 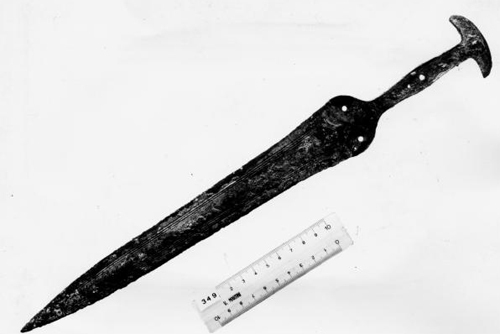 Decorated with carved beams along the edges of the blade, obtained with a burin. These are more or less than 100 km. Perugia. But maybe you wanted private collections? Thanks! No medieval or renaissance? I apologize for the delay, I was not in town. To my knowledge only a Renaissance sword: ( rapier "spanisch type") in the museum of the of Macerata. There are Kopis and Machaira.